William Sewell, Jr., is a particularly talented historian of French social history. His study of the guild mentalities of workers in Marseille after the Revolution breaks many preconceptions about “class” and the definition of labor (Structure and Mobility: The Men and Women of Marseille, 1820-1870 ). But he is also a philosophically minded observer and critic of historical writing. In Logics of History: Social Theory and Social Transformation he offers a singular contribution to historiography by an innovative interdisciplinary historian and sociologist. The book is a contribution to what I would call “applied philosophy of history”: careful, analytical attention to some of the problematic constructs and frameworks that underlie the ways in which scholars attempt to characterize and explain historical change. The issues Sewell raises resonate strongly with comparative historical sociologists — scholars who are concerned with analyzing social processes in a variety of settings over an extended period of time. Why do historians and social scientists need this kind of analysis? Because the logic and constructs involved in thinking historically are still incompletely understood. We will do a better job of understanding and probing the past, if we are more self-conscious about some of the assumptions and frameworks that we bring to our work. What is a historical “period”? What is an “event”? How are large historical constructs to be defined (revolutions, Tudor state, Marseillaise working class)? 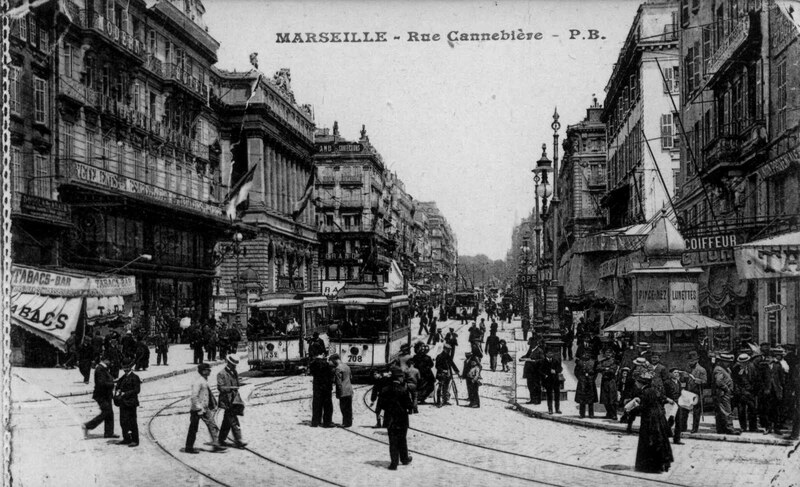 For that matter — is there anything of historical importance captured in the snapshot of a Marseille street scene in 1914 pictured above? Many historians have judged that the social sciences should somehow be relevant to their work of explaining historical outcomes. But what is involved in making use of social science theories in historical research and explanation? It has been evident for several decades that social processes are diverse, messy, and heterogeneous. So the impulse towards finding general laws of social transformation has been discouraged. But what is to take the place of a generalizing, universalizing approach within a “social science” study of social transformation? The best answer available at present is, an extensive borrowing from a wide range of the human sciences. The social sciences can provide a toolbox of mid-level theories of mechanisms, mentalities, and institutions that can provide resources for historians as they attempt to analyze and explain particular historical episodes. What can anthropologists tell historians about the challenge of reconstructing the mentalities of people in the past? What can the geographers of place tell us about the logic of trading and transport networks? What can researchers on collective action tell us about some of the factors that may have accelerated or inhibited popular protest in particular historical settings? Some philosophers have offered to shed light on these abstract questions about the ontology of history and the logic of historical explanation through philosophical analysis — for example, Ian Hacking’s Historical Ontology . Sewell’s approach to these meta-historical questions is not from the point of view of philosophy, but rather from that of the methodologically sophisticated practitioner. And the results are noteworthy. Logics of History makes a very substantive contribution to the revitalization of the field of the philosophy of history. Sewell’s volume provides a reading of the intellectual development of social history as a discipline since the 1960s: the currents of Marxism, anthropology, and post-modernism, and the themes of underclass history, local meanings, and multiple texts. Sewell’s central goal is to shed light on some of the core theoretical constructs that are used in historical research. There are chapters on the concepts of temporality, structure, culture, synchrony, the event, and historical duration. Other important topics that Sewell considers include the intellectual foundations of our conceptions of structure (“A Theory of Structure”) and culture (“The Concept(s) of Culture”), and the involvement of both these concepts in historical cognition. In both instances Sewell takes up a large meta-concept within the social sciences and subjects it to careful analytical attention. The results are substantial; both essays suggest new ways of thinking of the role of social structures and cultures within historical processes—not as fixed, uniform causal influences, but as flexible and plastic constructs within which historical actors live and act. These topics are important because their nuances can significantly affect the practitioner’s process of reasoning and inquiry as he or she treats historical processes. If the investigator begins with an assumption of fixed causal laws, then he or she is inclined to regard specific historical developments as instances of historical regularities. If, on the other hand, one approaches historical processes as involving a high degree of contingency and plasticity of historical events and structures, then one will give substantially greater attention to the specifics of the case.